This thrilling 16 Foot Deep Sea Waterslide will keep you mesmerized. Bring the water fun and party to you. The slide is fast and fun. Extra wide and long you will not be able to resist the excitement. Please measure the area to make sure it will fit in the space required. Order early for great summer fun! 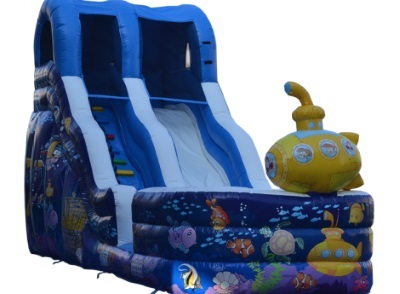 Any Slide, including the 16 Foot Deep Sea Waterslide, over 16 foot must have a large gate 48 inches or more These slides require a large flat area. Our driver must be able to dolly to the location of setup. Rock paths and steps air conditioners and other obstacles may cause your delivery to be cancelled and a cancellation fee to be charged The entire pathway to setup location requires a smooth roll 48 inch width. No slide will go over a wall, no slide will go up or down steps. If you book a slide and do not have access to deliver there will be at least a 75.00 or more cancellation fee depending on the slide. Our delivery driver will make the determination of deliver-ability with the safety of himself, your family, and the slide as the guidelines. JumpMaxx prides ourselves in providing America with newer, cleaner, high end entertainment with inflatables like the 16 Foot Deep Sea Waterslide and many others.